We’ve improved the office contacts module to make it easier for you to manage your buyers, sellers and other people, such as vendors, whom you communicate with regularly. 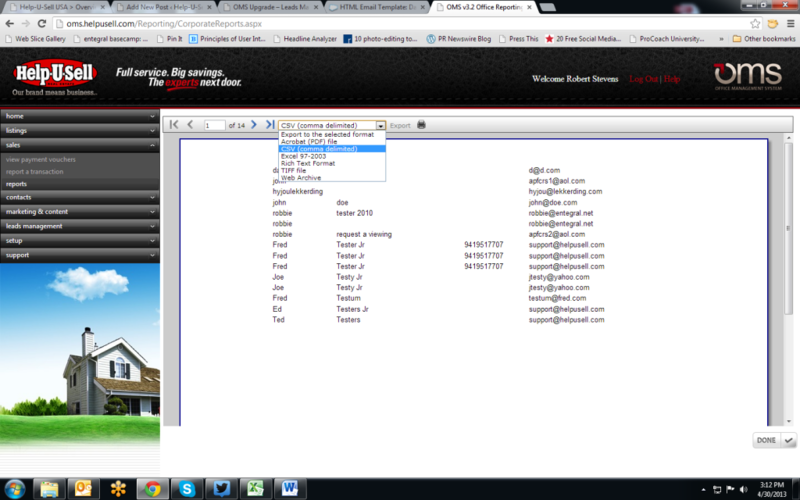 The redesigned module allows you to sort by first name, last name, contact type, and email address. 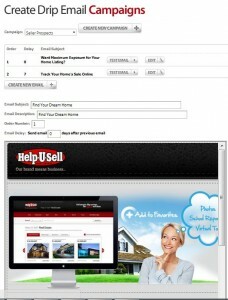 This way, you can quickly locate a contact’s information or just see all of your sellers listed together. The updated Office Contacts module allows you to sort your contacts and to see what they're subscribed to at a glance. With the addition of the acronym icons, it is easy to tell at a glance who is subscribed to what services you offer. FTK stands for First to Know, the email alerts buyers receive when new properties that fit the buyers’ criteria come on the market. DEC means Drip Email Campaign. S.LGN is the Sellers’ Login that enables sellers to view some back-end information about their listings and to share documents with you. By clicking the View button to the right of the icons, you can look at the contact’s more detailed information, including phone number, birthday, listing address (if the contact is a seller), search criteria (if a buyer is signed up for FTK), and drip email campaigns. You are also able to edit or add to contact information from this screen. Have you tried it out yet? Let us know how you like it and if you have any requests or suggestions for further enhancements. Several of our franchisees requested the ability to export leads and contacts from the Office Management System. We have just added this functionality to the back-end, in the Reports section. To access these exports, click on Reports under the Sales tab. To access contact and lead export tools, click on Reports on the Sales menu in OMS. Once you’ve selected either Contact or Lead export, you can choose a specific category to export. In this example, Sellers have been chosen from the Contact category. Choose a specific contact type (or choose all) to export from the OMS. There are six options for exporting the generated list of contacts or leads, including Acrobat (PDF), Excel 97-2003 and CSV, which will likely be the most useful. You can export your contacts and leads in six different formats, including CSV and PDF. If you have any questions about the new functionality or would like to request additional export or report categories, contact us at support[at]helpusell[dot]com. Following other streamlining changes we’ve been making to the Office Management System, we’ve consolidated the leads management module into one easy-to-use page. 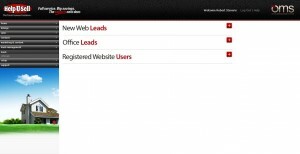 You access your new web leads, office leads, and registered website users from this module. You can also manually add office leads. By clicking on the “View Details” button, you can find out what the lead requested information about, define the lead type (Buyer or Seller), and the lead source (options include Internet, ETM, and walk-in). Once you choose Buyer or Seller, you have more options that are tailored to the lead type. 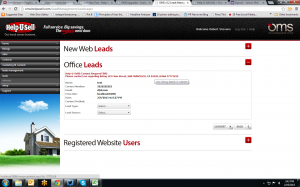 You can access more information about your office leads by clicking on the View Details button. You can also convert the lead to a contact once the buyer lead has bought a home with you or the seller lead has signed with your office. You can select the lead type and source, add information about the lead, and convert the lead on the details section. The registered website users are separated from the other leads because they are “self-serve” leads. You can see their saved listings and what listings were viewed, as well as the leads’ email search parameters. The contacts module is next to be redesigned, and it will have a sort feature, among other new additions. If you have any questions or feedback about either the leads management module or the contacts module, please let us know in the comments or via email. The highly anticipated drip email module is close to completion. We aim to launch officially next Tuesday, Sept. 4, but it is available now via OMS. You can access it under the Marketing & Content tab. The module, named Drip Email Setup, has been preloaded with a few drip email campaigns, including ones for newly registered buyers and sellers, and agents you’re recruiting. We will add more in the next few weeks. You can modify all of the existing campaigns to fit your writing style, and we encourage you to localize them to your office and marketplace. We have embedded some automated personalization into the emails. For instance, the signature will include ##OFFICE_NAME##, which will be filled in with your office name when the email is delivered. A cheat sheet containing these personalizations will be accessible in the module soon. You can also create new emails for the campaigns we’ve created, as well as create whole new campaigns. All of the emails have headers, footers and images that you are free to use for your new emails. The system will allow you to upload your own images, too. The new Help-U-Sell drip email module enables brokers to edit existing emails, create new ones, schedule messages and make new campaigns. After you have your campaign messages ready, you can set up the emails to send out automatically on a schedule that you determine. For example, within a campaign, the first email would be indicated as the #1 message with 0 days’ delay. The second email would be named #2 and send out 7 days (or however many days you choose) after the first email is sent, and so on. You will also be able to create and schedule recurring emails. We suggest you use the Test Email button to see how the email will appear to the recipient before you send out the email. You will set up your campaigns and monitor the results in the Campaign Setup section. The Active Campaigns tab lets you see when campaigns began, their statuses and how many contacts have received each message. Clicking on the View Details button will display when a campaign’s emails were sent (or will be sent), who received them and whether a recipient is active or unsubscribed from your campaigns. Brokers can view all active email campaigns to see when the emails have been or will be sent out. 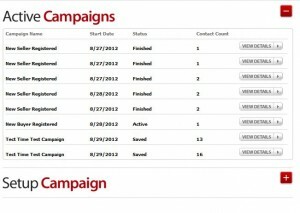 The Setup Campaign tab is where you select your contacts to receive each campaign’s emails. You can also change the “from” address (by default it is “noreply@helpusell.com”) and the date your campaign will start. 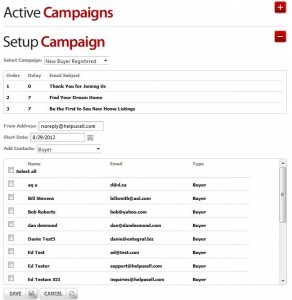 The Setup Campaign tab is where you choose who receives the emails for each campaign. The last piece of the puzzle is your contacts. You will want to make sure your office contacts are up-to-date and in good order. This is where the module will obtain the contact lists for your campaigns. You can create new contact lists in My Office Contacts. Some examples of useful contacts lists include past clients, potential agents and seller prospects. How do you plan to use the drip email module? Tell us your campaign ideas. Also, we encourage you to test out the module this week, and if you have any questions or suggestions, please contact us. We are almost finished upgrading the Office Management System to match your broker and the corporate website redesign and to make the OMS easier to use. Here is a preview of how the new OMS Dashboard will look. The graphs will be moved below the Alerts in the actual working version. 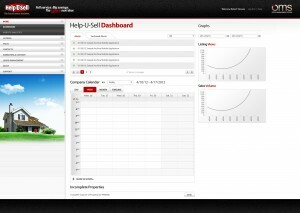 Here is a preview of the new Help-U-Sell Real Estate Dashboard redesign. In the new design, you will also be able to add custom events to the calendar. We expect to have the new Dashboard up and running by the end of the week. We are also redesigning and streamlining the Listing Module. It will resemble an MLS form, and the number of tabs will reduce from the current eight down to just four. We want to hear your feedback on the new look and, once it’s live, the functionality of the OMS redesign. Comment below or contact Tony directly.